Senator John McCain, the Vietnam war hero turned senator and presidential candidate, has died aged 81. Mr McCain died on Saturday in Arizona surrounded by his family, a statement from his office said. He was diagnosed with an aggressive brain tumour in July 2017 and had been undergoing medical treatment. His family announced on Friday that Mr McCain, who left Washington in December, had decided to cease treatment. His widow, Cindy, tweeted: "My heart is broken. I am so lucky to have lived the adventure of loving this incredible man for 38 years. He passed the way he lived, on his own terms, surrounded by the people he loved, in the place he loved best." Mr McCain's daughter Meghan said the task of her lifetime would now be "to live up to his example, his expectations, and his love". Following news of his death, wellwishers waving flags lined the street as a hearse brought Mr McCain's body from his ranch in Sedona, Arizona, to a funeral home in Phoenix. The six-term senator for Arizona and 2008 Republican presidential nominee was diagnosed after doctors discovered his tumour during surgery to remove a blood clot from above his left eye last July. His family said he would lie in state in Phoenix, Arizona, and in Washington DC before a funeral at the Washington National Cathedral and his burial in Annapolis, Maryland. Former presidents Barack Obama and George W Bush are expected to give eulogies. The son and grandson of Navy admirals, Mr McCain was a fighter pilot during the war in Vietnam. When his plane was shot down, he spent more than five years as a prisoner of war. While in the custody of his captors, he suffered torture that left him with lasting disabilities. In politics, he took a conservative line on many issues, including opposing abortion and advocating higher defence spending. He backed the 2003 invasion of Iraq and criticised President Obama for not intervening more in the Syrian civil war. However, he also gained a reputation as a Republican maverick who was willing to cross party lines on a range of issues. In July last year, just after his diagnosis, he took part in a late-night Senate session and gave the deciding vote - with a thumbs-down gesture - against partially repealing the contentious Obamacare healthcare law. The move reportedly infuriated Mr Trump. Mr McCain also criticised President Trump's hard-line rhetoric on illegal immigration and his attacks on the media. John McCain was born on the eve of World War II, at the dawn of the "American Century" - a time when the US was at the peak of its political, military and cultural power. He dies at what could be considered that age's twilight, as the nation turns inward and contemplates walls, literal and metaphorical, to insulate itself from the rest of this world. The life of the senator from Arizona marked the arc of this journey. He suffered, as the nation suffered, from the morass of Vietnam. As a young politician he was tempted by the lure of power and money, caught up in an influence-peddling scandal that nearly cost him his career. In his first run for president in 2000, he capitalised on an anti-establishment sentiment and longing for authenticity that would later come to crest with Donald Trump's election. In 2008, he won the Republican nomination, only to see his hopes dashed by the phenomenon that was Barack Obama and a crumbling US economy. McCain never won the top political office for which he longed. Throughout his life, however, he offered a full-throated defence of an America that was active and engaged in the world. In his final years he sparred with Mr Trump over the direction of the Republican Party and the principles it should embrace. It's an open question as to whether these views have a future in his party. McCain, however, fought for what he believed was right until the very end. Agree with him or not, that is undeniably a most appropriate epitaph. Tributes began to pour in for Mr McCain as soon as the news of his death was announced. Former President George W Bush described Mr McCain as "a patriot of the highest order", adding: "He was a public servant in the finest traditions of our country. And to me, he was a friend whom I'll deeply miss." Sarah Palin, who was Mr McCain's running mate during his 2008 bid for president, said the world had lost "an American original", sharing a picture of herself with the man she called her friend. Donald Trump, whom Mr McCain has strongly criticised, tweeted his "deepest sympathies" to Mr McCain's family but made no comment about his life. Sources quoted by US media said President Trump would not be invited to the funeral and the current administration would probably be represented by Vice-President Mike Pence. Tributes were also paid from the other side of the political spectrum. Barack Obama, the Democrat who beat Mr McCain to the presidency, said despite their differences, they shared "a fidelity to something higher - the ideals for which generations of Americans and immigrants alike have fought, marched and sacrificed. "Few of us have been tested the way John once was, or required to show the kind of courage that he did," Mr Obama said. "But all of us can aspire to the courage to put the greater good above our own. "At John's best, he showed us what that means." Former vice-president, long-time friend and political opponent Joe Biden said Mr McCain's "impact on America hasn't ended". "John McCain's life is proof that some truths are timeless," he said in a statement. "Character. Courage. Integrity. "A life lived embodying those truths casts a long, long shadow. 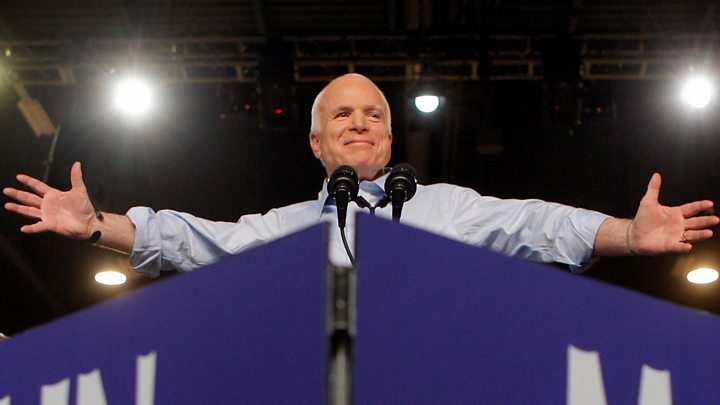 John McCain will cast a long shadow."